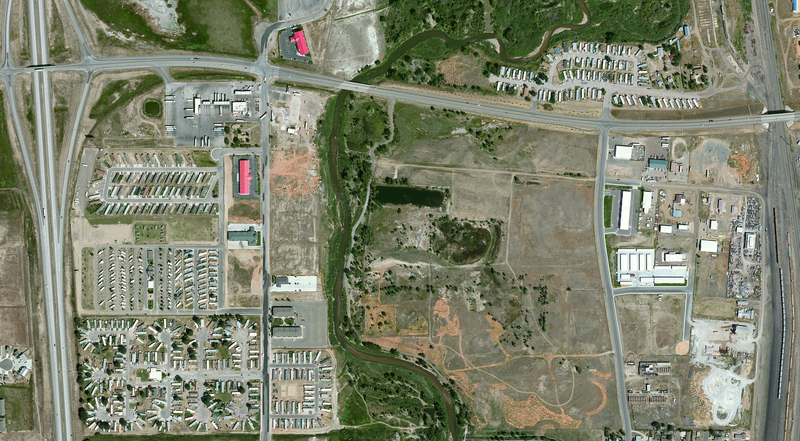 While most of this project and website have been devoted to the area that was purchased by the Laramie Rivers Conservation District in January of 2012, there was an additional 232 acres of property that was used for the original refinery operations. The original area was bounded by, (using landmarks that are present today); on the east by the Union Pacific Railroad yard, on the south by Harney Street, the western boundary was Interstate 80, and the northern boundary was Mitchell Street, (in Lee’s Mobile Manor). 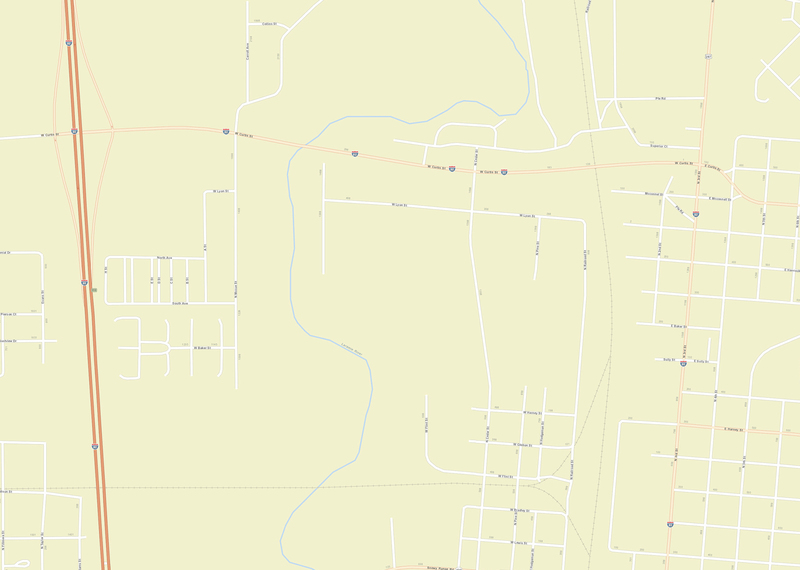 The maps below are graphical representations; both are courtesy of the Albany County Geographic Information Services,(ACGIS), (http://www.co.albany.wy.us/gis.aspx). The first is an aerial, (satellite) view; the second is the city street map. (Click on each of the maps and images for a larger view). Aside from the 4.6 acre site, there are three buildings that remain from the original refinery operations, along with the original pipeline easement. 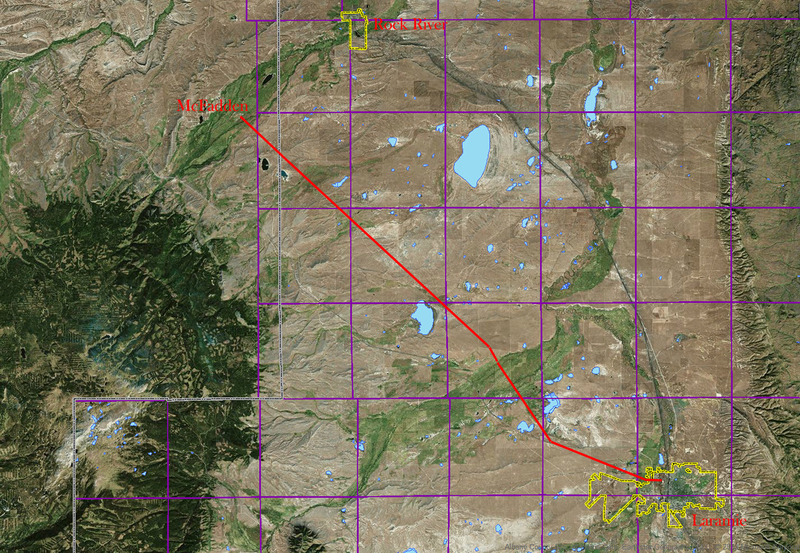 The original pipeline was six inches in diameter, and was 38 miles in length. It originated in the Rock River Oil Field, near what is now McFadden, Wyoming. The initial name of the McFadden was actually Ohio City, and had a large oil drilling and extraction operation in place. 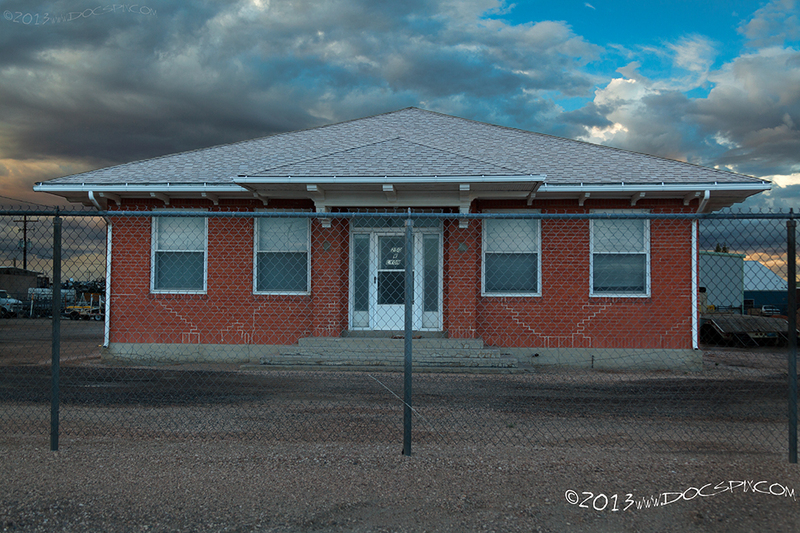 This location had a number of buildings; including a small hospital, dining hall, office, and dormitories. The pipeline was constructed by the Illinois Pipeline Company, with work starting in the fall of 1919, and completion in late July of 1920. The images below are from a 1926 map, with a map from the ACGIS showing the same approximate route. This easement is still in use today, and has a 12” pipeline owned and operated by Source Gas. A few items that are interesting to note: there are no motor routes on this map. Only city and town names, (all within Albany County), range and township markers, railroads, and waterways. There is another pipeline that was constructed from the Rock River Oil Field to the town of Rock River. 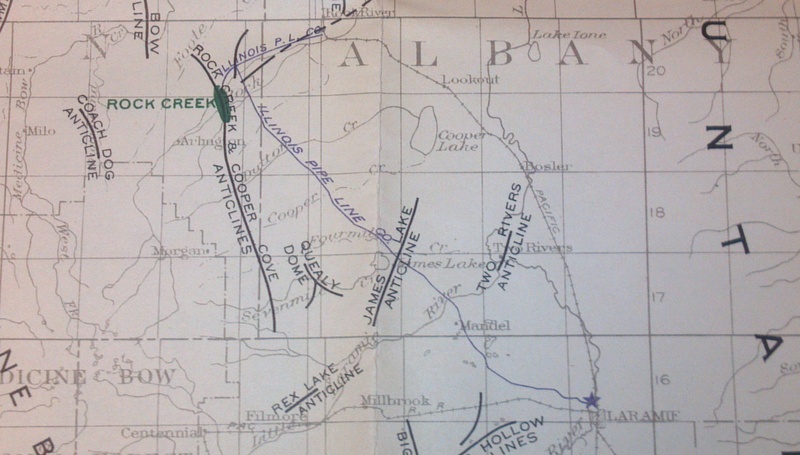 This pipeline was constructed prior to the decision to locate the Albany County refining operations in Laramie. Also of interest is the fact that at least three of the towns shown no longer exist. 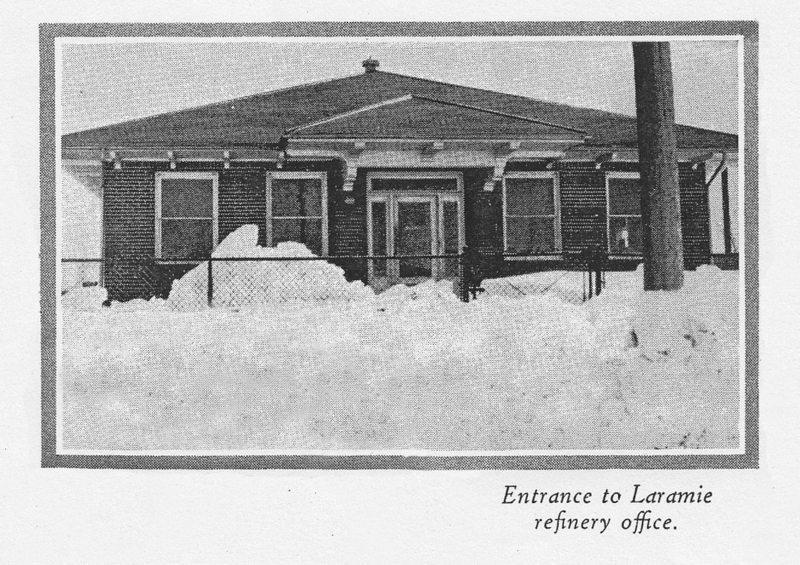 The three buildings that remain standing and in use today that are not located on the LRCD property are the AAA Salvage & Recycling building and two buildings that are owned by Source Gas. The AA Salvage building was originally used as the laboratory for Midwest Oil, and also served as a warehouse for the refinery operations. To date, there are no known images of this building during its operations under Midwest ownership. There will be more images and information about the three buildings coming soon. Starting in 1984, the Wyoming Department of Environmental Quality began to investigate the groundwater for contamination. This was done in conjunction with the Environmental Protection Agency’s investigation into the groundwater contamination. When the refinery was constructed, the field between the refinery and the storage tanks was filled with asbestos as a means of fire protection. 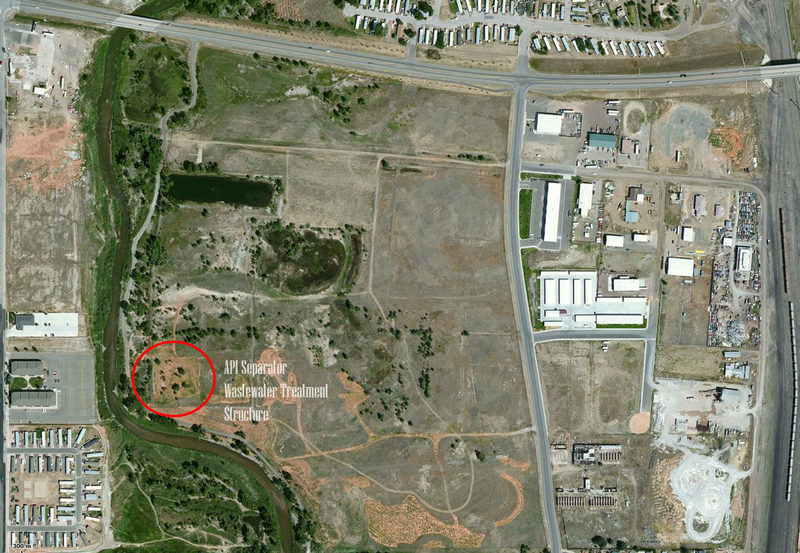 There was an oil/water separator and a waste water treatment structure located near the Laramie River, close to the south western portion of the site. These were removed in the summer of 1990. The separator was a large structure, most of which was placed underground. The dimension of the separator was 60 by 100 feet and approximately 9 feet in depth. The wastewater treatment structure was smaller; its dimensions were 15 by 21 feet, with a depth of 14 feet below the ground surface. The area west of Cedar Street had ten inches of top soil brought in, and placed over the site in 1989 and 1990. The final report released by the WDEQ in November of 1995 Amoco was ordered to monitor the site to ensure that all areas of vegetated growth were proven to be adequate within three growing seasons. Amoco was and subsequently, BP is still required to ensure that the area remains fenced off and all access gates remain locked at all times. It has since been delisted from the EPA’s superfund sites.